Coming to grips with C++11 and C++14 is more than a matter of familiarizing yourself with the features they introduce (e.g., auto type declarations, move semantics, lambda expressions, and concurrency support). The challenge is learning to use those features effectively—so that your software is correct, efficient, maintainable, and portable. That's where this practical book comes in. 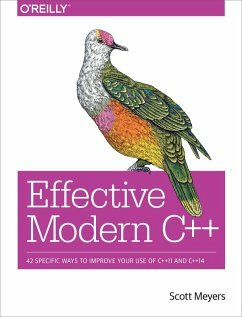 It describes how to write truly great software using C++11 and C++14—i.e. using modern C++.Topics include:The pros and cons of braced initialization, noexcept specifications, perfect forwarding, and smart pointer make functionsThe relationships among std::move, std::forward, rvalue references, and universal referencesTechniques for writing clear, correct, effective lambda expressionsHow std::atomic differs from volatile, how each should be used, and how they relate to C++'s concurrency APIHow best practices in "old" C++ programming (i.e., C++98) require revision for software development in modern C++Effective Modern C++ follows the proven guideline-based, example-driven format of Scott Meyers' earlier books, but covers entirely new material. For more than 20 years, Scott Meyers' Effective C++ books (Effective C++, More Effective C++, and Effective STL) have set the bar for C++ programming guidance. His clear, engaging explanations of complex technical material have earned him a worldwide following, and they keep him in demand as a trainer, consultant, and conference presenter. Winner of the 2009 Dr. Dobb's Excellence in Programming Award, he has a Ph.D. in Computer Science from Brown University. His web site is aristeia.com.